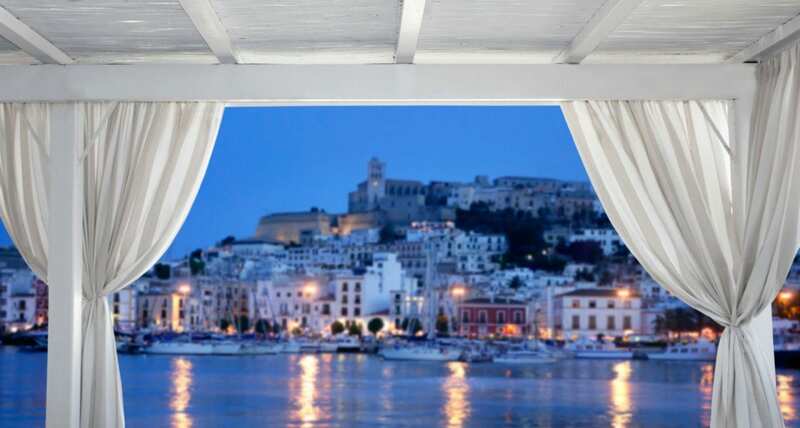 Greece is one of the loveliest destinations of a luxury charter cruise of the Mediterranean. The eco of the sea narrated in the legends of gods and heroes resonates among the vestiges of the glorious past that made old Hellas the heart of the cultural life of the known world. 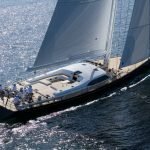 Today Greece is an ever more appreciated destination of luxury charters. Here you can match itineraries among the ruins and relaxing moments at trendy spots, perhaps sipping a drink at sunset. More importantly, Greece enchants the tourist with the landscapes, strips of sands and coves that dot its coastline. 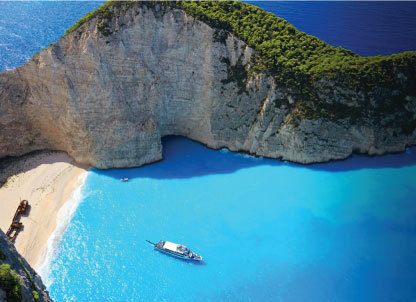 We have already recommended a yacht itinerary of the Cyclades, now let’s turn to Greece’s loveliest beaches. 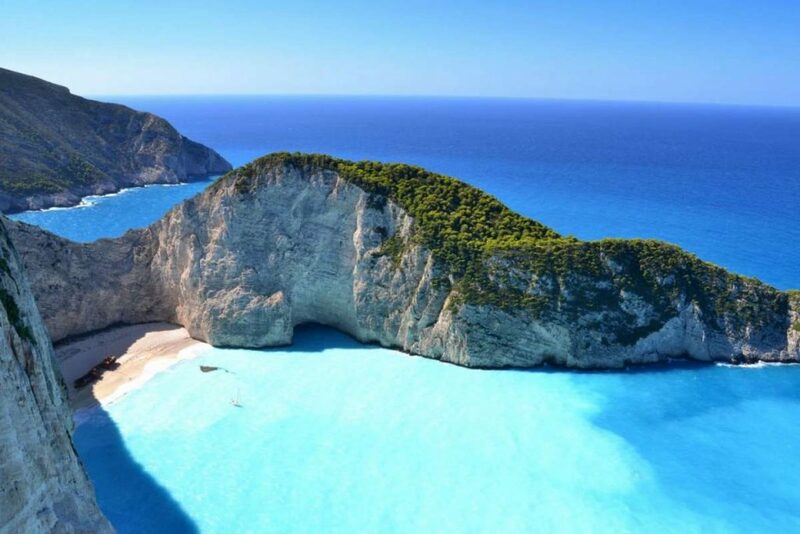 Zante’s Shipwreck Beach dominates Condè Nast’s chart of Greece’s loveliest beaches . This isolated cove that can be reached only by boat boasts a strip of fine white sand and pebbles caressed by an intensely azure sea and by the embrace of steep walls of white rock. The site owes its name to MV Panagiotis, a Greek cargo boat that shipwrecked here and is still visible today. Dodging the Coast Guard with a load of smuggled cigarettes, the boat hid in the cove and run aground in the shallows. It was 1980. The undertow and huge sand volume caused by the boat’s volume gave birth to the famous beach that has, since that day, been called “Shipwreck beach” after the boat deserted by the smugglers. Santorini’s White Beach is certainly one of Greece’s most striking beaches. It owes its name to the white cliffs that surround it. Featuring black pumice sand and white and gray pebbles, this not-so-popular, dreamy site can be reached only by sea. Fans of snorkeling love its many underwater grottoes and unforgettable landscape. Sarakiniko in Milos, an island of the Cyclades, is known for its white streets, thermal baths, and crystal waters, but its best features are the beaches! The lack of vegetation of Sarakiniko Beach, the striking geological formations and calcareous stones eroded by water and wind through the centuries, create a lunar landscape. 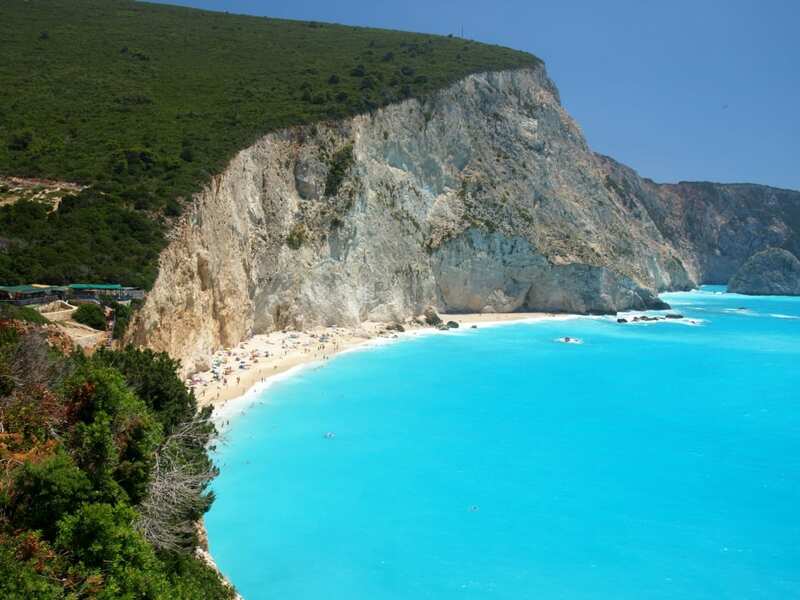 This unforgettable spectacle puts it in our Top 5 of Greece’s best beaches to reach by yacht. Rhode’s is the largest island of the Dodecanese, appreciated for its mild climate and transparent sea. It has repeatedly been awarded the Blue Flag in recent years for the excellent quality of its waters. 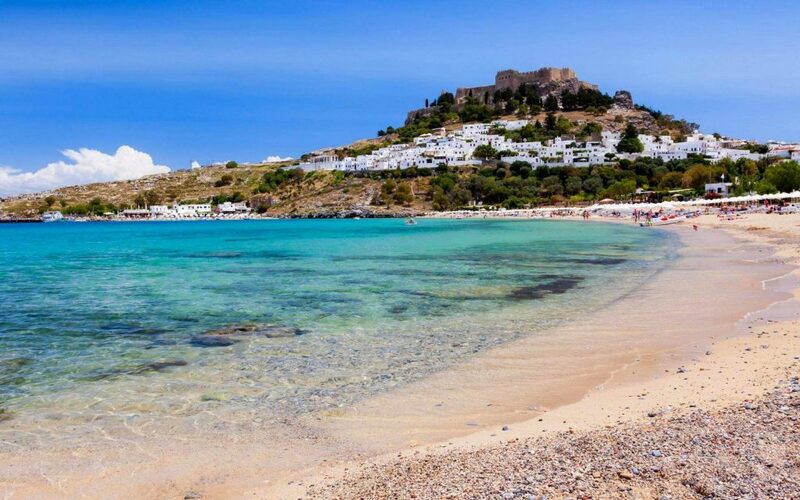 Rhodes is home to St Paul’s Bay, yet another dreamy beach that you should visit during your holiday on a luxury charter in Greece. This isolated bay enclosed between high and jagged rocks is a must-visit site for snorkeling and sailing enthusiasts. It boasts rocky and sandy strips of sand. Arriving here by yacht, enjoy the lovely landscape and bathe offshore, far from the crowd that in the summer flocks to this site. 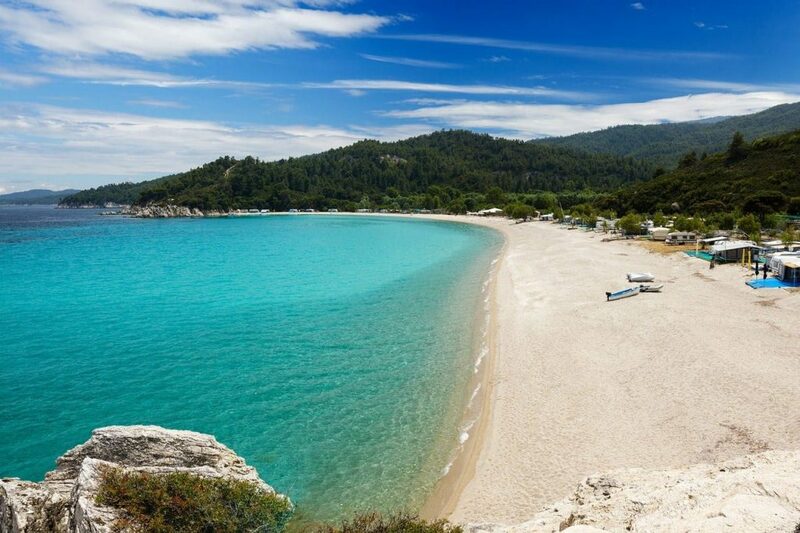 Our list of Greece’s most stunning beaches that will make your luxury charter cruise unforgettable leads us to Voidokilia beach, in the South-West of the Peloponnese. The perfect half moon shape of this narrow strip of sand is enclosed in a quiet bay that is linked to the open sea by a small opening. This enchanting and wild site is part of a nature park. These are some of Greece’s best beaches, but you will discover many more wonderful spots during your yacht holiday. 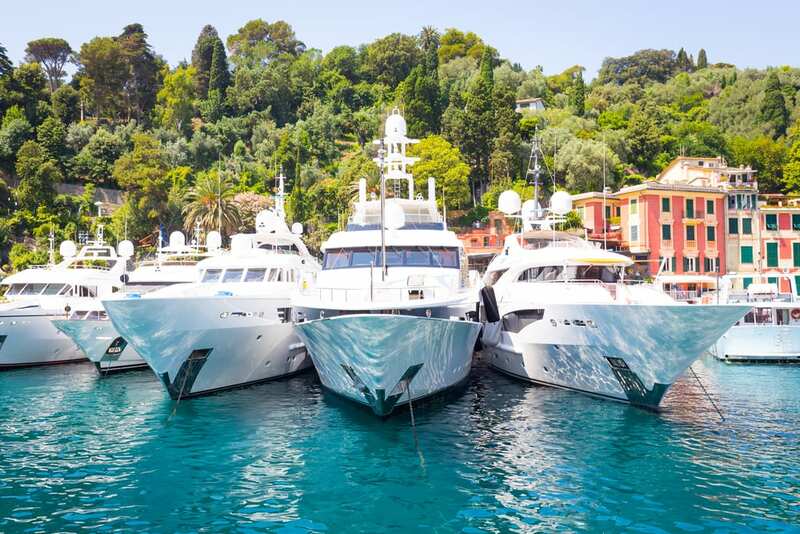 Landscapes of stunning beauty and unspoiled nature will make your heart sing, with the waves lulling you as you enjoy the exclusive comfort of your luxury super yacht.